Ceylon Tobacco Co PLC’s new Chairman, Jayampathi Divale Bandaranayake will amalgamate his responsibilities, fully conscious of the sensitivities and emotions associated with the tobacco trade. He succeeds Ken Balendra who steps down from the CTC Board after nine years as Director of which the last five years has been as its Chairman. The transition will be effected tomorrow (25) after the Annual General Meeting. Chandra Jayaratne will stand down as CTC Director after 16 years. “I have every confidence that CTC will conduct its business in an extremely responsible manner being fully conscious of the sensitivities and emotions associated with tobacco products. Through modern management practices, the company will continue to ensure that interests of all the stakeholders in the years to come will be well served,” Bandaranayake told ‘Daily News Business’. He endorsed that the biggest beneficiary of the company’s business was the Government where over 80% of the company’s revenue went to the state coffers, equating to well in excess of 7.5% of the Government’s total tax revenue. Commenting on the company’s role in Corporate Social Responsibility, the new Chairman stressed that a new Committee that the company has considered and the Board has been keen to establish, was the Corporate Social Investment Committee so that all the social investments that the company made will have greater impact in addressing and solving core national social issues, primary of which will be poverty alleviation through sustainable agriculture. “This effort will be led by the management team but with the guidance of the Board of Directors,” he said. Commenting on the company’s organisational structure, he said: “Unlike in several blue chip companies, CTC has the role of the Chairman and the CEO being separated. The Chairman and the Directors are held accountable for the duties and the responsibilities in the Companies Act. “We have an excellent Board of Directors and their wise counsel and guidance make the role of the Chairman much lighter, having an excellent equilibrium between the Executive and non Executive Directors” he said. Bandaranayake joined CTC as a management trainee in 1967. A Fellow Member of the Institute of Chartered Secretaries and Administrators of UK (FCIS) and a Bachelor of Laws (LLB) Graduate of the Open University of Sri Lanka, he rose through the ranks of the company as Personnel Manager and as Head of Human Resources in 1984. 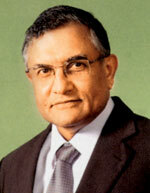 He was promoted to the CTC Board as Human Resources Director in 1990 and later as Deputy Managing Director in 1990. Presently, he also serves on the Boards of Directors of Hayleys PLC, James Finlay and Company (Colombo) PLC, Coca Cola Beverages ( Sri Lanka) Ltd, Sampath Bank PLC, Union Assurance PLC and the Board of Investment of Sri Lanka. He is also the immediate past Chairman of the Employers Federation of Ceylon and Vice Chairman of the Ceylon Chamber of Commerce.